College of Education Music Education student Shane Colquhoun has been named a quarter finalist for the Grammy 2019 Music Educator Award. The Auburn doctoral student is the band director at Loachapoka High School, where he also serves as the varsity basketball coach. Colquhoun is originally from Brooklyn, but he moved to Orlando with his mother at age 12. He joined the band program at Ocoee Middle school, where he also played basketball. Following graduation in 2006, Colquhoun was recruited to Auburn for his Master’s by Music Education faculty members Kim Walls and Jane Kuehne. 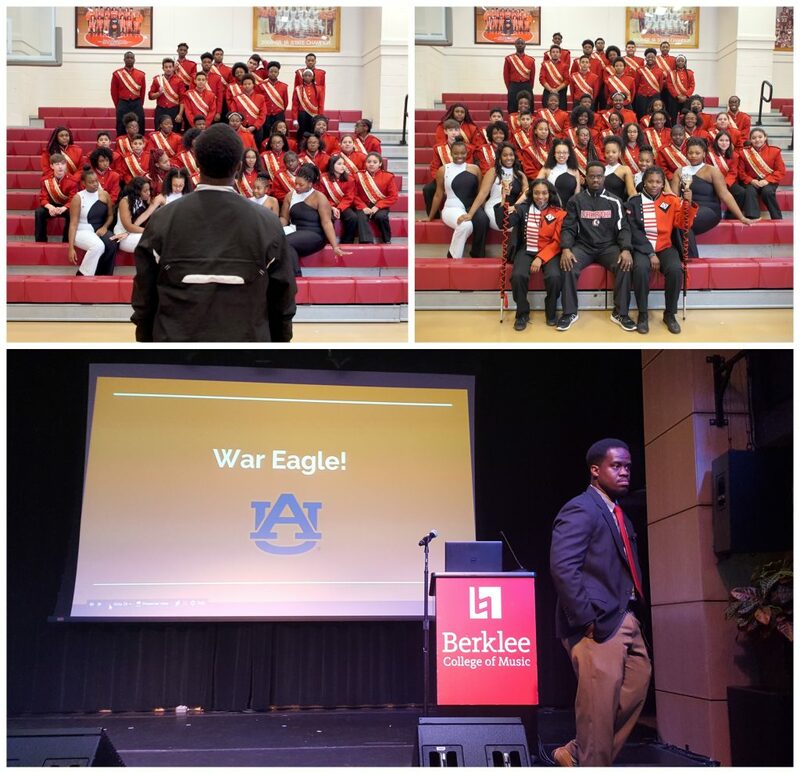 While things went well in the classroom, coming to Auburn from an HBCU was a culture shock for the aspiring music teacher. In the fall of 2007, Colquhoun began teaching classes at Loachapoka High School as part of his practicum requirements and research project with Dr, Kuehne. These lessons consisted of technology in popular music. As a result, Colquhoun built relationships throughout the Loachapoka community, and upon receiving his Master’s in 2008, he was hired to resurrect a music program that had essentially withered away. The Loachapoka music program receives virtually no financial support, so it must raise its own funds to buy instruments and uniforms. With a total enrollment of 220 students in grades 7-12, Colquhoun finds a way to work with virtually every student. While teaching at Loachapoka, Colquhoun earned a second Master’s in Higher Education Administration in 2014. He cited the excellent examples of Drs. Jim and Maria Witte in that department. “They were amazingly generous with their time and expertise,” he said. Colquhoun hopes to complete his doctorate by December. His dissertation topic examines teacher preparedness to teach non-traditional music in secondary schools. Colquhoun has a busy life. His wife works in the Chemistry Department at Auburn, and they are parents to a one-year-old son. As he writes his dissertation, he is also gearing up for a new season of marching band and getting his team ready to win on the hardwood.